Energy Conversion for Excel can quickly, easily and reliably calculate thermodynamic and transport properties of a few gaseous, liquid and solid species, analyze power cycles, power cycle components/processes and compressible flow. 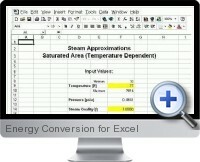 This Excel energy conversion solution is ideal for those who are involved at various levels with design, operation and management of energy conversion systems (power and propulsion systems). It provides the opportunity to more quickly, easily and effectively accomplish energy related work, explore more options, save time and give more confidence in carrying out calculations.